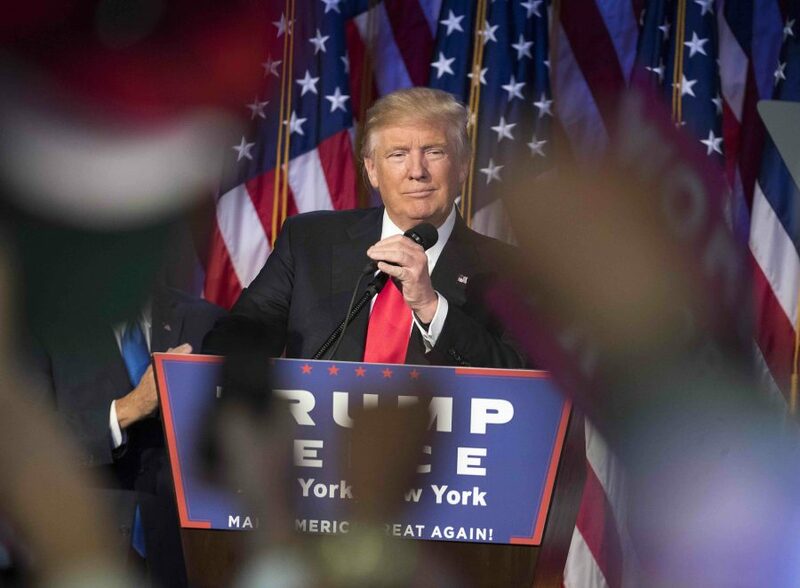 President-elect Donald Trump speaks to supporters at the Election Night Party at the Hilton Midtown Hotel in New York City on Wednesday, Nov. 9, 2016. As the presidential election swayed from favoring Hillary Clinton to Donald Trump, Evanston residents at Tommy Nevin’s Pub transitioned from celebrating U.S. Rep. Jan Schakowsky and state Rep. Robyn Gabel’s victories to contemplating the possibility of a President Donald Trump. After both congresswomen left their election viewing party, volunteers, supporters and city officials remained to witness history. As it became clear that the election would be closer than initially expected, some residents of Evanston — a predominantly Democratic city — began to worry. Jack Hedquist, a 66-year-old Evanston residents, said he was looking forward to an easy Clinton win until he received a phone notification that gave him the first hint that the Democratic Party wouldn’t have the effortless night previous predictions indicated. Evanston resident Joan Ducayet said the quick shift in expectations shocked her and that the nation’s inability to choose a more qualified candidate was deeply upsetting. At the viewing party, one Trump supporter watched his favored candidate gain the lead from the back of the pub. Evanston resident Jon Gordon, 31, said Trump is fit to bring the change the domestic economy needs. But Gordon said he doesn’t believe the candidate would remain in office for long. Mayor Elizabeth Tisdahl told The Daily in a phone call before the election results were determined that Evanston will remain the welcoming neighborhood is has been for decades no matter who is elected president. Tisdahl, who said she supports Clinton, said it was “regrettable” that the election wasn’t swinging in favor for the Democratic nominee. “Evanston will continue to be Evanston in spite of Donald Trump,” Tisdahl said before the results pointed to the Republican nominee as the winner.